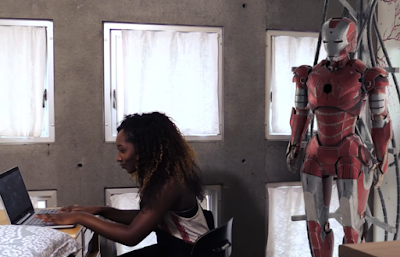 VIDEO: MIT Turns to Marvel's Riri Williams for "Pi Day"
As if the folks at MIT weren't brilliant enough already, it seems they're pretty awesome at making a fan film of sorts too. Featuring Marvel's Riri Williams (played by a real-life student, Class of 2018's Ayomide F.), the heir apparent to Iron Man, this promotional video for the school's "Pi Day" when they reveal the year's new batch of accepted students on March 14. The video follows Riri who's obsessed with her Iron Man design as she navigates her classes. She finally puts it all together at the end engaging her Iron Man suit (in the comics she becomes Ironheart) and flying around campus. It's impressively put together using a production team of current and former MIT students. It perfectly showcases the school's campus and facilities. The promo is a great mash-up of fact and fiction. Riri Williams, created by Brian Michael Bendis and designed by Stefano Caselli, first appeared in Invincible Iron Man volume 7 #7, written by Bendis and drawn by Mike Deodato. Riri, who also attends MIT in the comics, stars in the eighth volume of Invincible Iron Man, under the codename Ironheart. She was the perfect fictional alum to promote the school's history of ingenuity, innovation, and imagination. Check out this behind-the-scenes video too.